Hand carved gemstone egg in elegant dyed Blue Howlite. Howlite is usually white with black or grey veining and is often dyed blue to mimic the appearance of Turquoise. Howlite encourages healing by calming physically and emotionally. It dispels negativity and spurs ambition toward positive goals. The Walnut Finish Egg Stand is included. Hematite has been considered a "Stone of the Mind", enhancing mental attunement and original thinking. These eggs are mysteriously heavy and have the appearance of a polished silver mirror. The Walnut Finish Oriental Stand is included. Howlite is usually white with black or gray veining. It encourages healing by calming physically and emotionally. It dispels negativity and spurs ambition toward positive goals. The Walnut Finish Oriental Stand is included. Rare White Jade eggs have tiny pale green speckles and a beautiful high polish finish. One of the most auspicious stones in Chinese culture, Jade has been treasured as a "Bringer of Good Fortune" for centuries. We have a limited quantity of these rare eggs, order yours today! The Walnut finish Oriental Stand is included. These beautifully polished luscious mango colored Yellow Jade eggs from China are a rarity in this size and a great addition to your collection. The Chinese have always believed that "Jade Blesses that Which it Touches". The Walnut finish Oriental Stand is included..
Burmese Jade eggs have swirls of pale apple green with occasional tiny black speckles, which is a characteristic of Jade and a smooth polished finish. One of the most auspicious stones in Chinese culture, Jade has been treasured as a "Bringer of Good Fortune" for centuries. We have a limited quantity of these rare eggs, order yours today! The Walnut finish Oriental Stand is included. These superb quality Labradorite eggs have great peacock colored fire and flash as well as a nice polish that is unusual for Labradorite. Part of the Feldspar mineral family, Labradorite facilitates change in trying circumstances, plumbing the strengths of the inner self. The Walnut Finish Egg Stand is included. Lovely high quality, dark blue Lapis Lazuli eggs with the familiar Gold Pyrite markings. Lapis consists mostly of the mineral Lazurite which has been mined for over 5000 years. Lapis Lazuli was the revered stone of Ancient Egyptian King-Priests and Queen-Priestesses. The Walnut Finish Oriental Stand is included. A rare Lavender Blue shade of Lepidolite eggs from South Africa. Lepidolite is part of the Mica mineral group named after the Latin "to glitter". The lavender to violet color depends upon the amount of Lithium deposits in the stone which identifies Lepidolite from the other Mica silicate formations. It is said to have a refreshing energy of lightness, hope and acceptance. The Walnut Finish Oriental Stand is included. 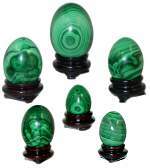 Extremely rare, superb quality Bull's Eye Malachite Eggs in 3 sizes from Zaire, have unique ornamental banding in contrasting green hues. The smaller eggs can be held in the palms for meditation or kept in a pocket as a healing stone. In ancient cultures Malachite was used as a power stone providing intuitive insight and guidance on the spiritual journey. Malachite is a stone of transformation and was highly prized by the Ancient Egyptians. The Walnut Finish Oriental Stand is included. Superb quality, Bull's Eye Malachite 52-55mm Eggs from Africa. Malachite has unique ornamental banded, contrasting green designs unlike any other stone. Malachite is a stone of transformation and was highly prized by the Ancient Egyptians. In ancient cultures Malachite was used as a power stone providing intuitive insight and guidance on the spiritual journey. The Walnut Finish Oriental Stand is included. These rare Kunzite Eggs have a brilliant polish and deep color. This sought after, spiritual stone is said to powerfully activate the heart chakra and provide intense healing love energy for self forgiveness and loving acceptance of others The Walnut Finish Oriental Stand is included.